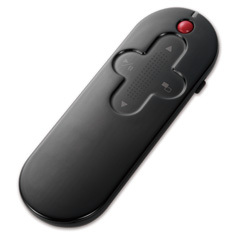 The Wireless presenter offers you great control for effective presentations. With simple design, the presenter is easy to use, and with Bluetooth technology embedded, the presenter can communicate with the host device without dongle, therefore, handy to carry and with great mobility. Combined wireless PowerPoint controller with the laser point, the Wireless presenter enables the user to control presentation slides wirelessly indoors, and use the laser pointer up to 15 meters from the target. Taking into consideration the needs of users, we embed the touchpad design on this presenter, so that the user can slide up or down to quickly scroll through the pages. Have the Wireless presenter in hand, and you will sure have success in business.